There are several different options when it comes to having surgery to attempt to rectify snoring problems and facilitate a cure. Surgery for snoring is used as a last resort usually after other less invasive methods have failed and when the snoring problem is significant. Often a change of lifestyle by the patient can often be as effective, if not more so, than surgery. Things like losing weight, stopping smoking or reducing alcohol consumption are often very effective in some cases. As with any medical procedure there is always an associated risk of complications. The effectiveness of the procedure, many surgeries, at best often only offer about a 55% chance of success. Many procedures that are initially successful are often only a short term gain and eventually many patients revert back to their original snoring problems. Then the cost has to be considered. Many insurances do not consider many snoring situations a health problem and therefore the cost of any operation has to be met fully by the individual. The pain that the patient has to go through for a not particularly high chance of success. Often the patient, depending on the procedure, may have to go through this many times. The surgical procedures can sometimes mask sleep apnea making it far more difficult to diagnose and delaying this diagnoses where appropriate. LAUP is often considered as an alternative to UPPP as it is less expensive and more comfortable for the patient. Instead of tissue being cut away as with UPPP, with LAUP the excess tissue is vaporized with a laser. Unlike UPPP, LAUP can be performed more than once. Sometimes it is necessary to undergo the treatment up to 4 times. Although the procedure is accepted as being more comfortable for the patient the pain during recovery is as intense as with UPPP. Therefore it is possible that the patient will undergo this pain 4 times. Similarly to UPPP success rates are not high and typically after 2 years the procedure is found to be effective in 55% of cases. LAUP is unsuitable for people with a strong gag reflex. CAPSO is similar in the tissues that are treated but instead of using a laser, electrical cauterization is used. This has the result of stiffening the soft palate. The procedure can be carried out under a local anesthetic in a single visit. Like LAUP the procedure can be repeated several times until the desired result is achieved. Again like LAUP the patient suffers similar pain each procedure. The efficacy is similar to that of LAUP with a success rate of about 55%. This is a relatively new treatment that locally heats tissue to 85 degrees C. this causes controlled scarring which have the effect of tightening the tissue. It is completed very quickly and the resulting pain is much less than that for the previous procedures. It does require several treatments to achieve the desired result. Although the inconvenience to the patient is much less the success rate seems similar to more established treatments. The areas that are treated by RF ablation are still being widened so this may be more successful as the treatment develops. This straightens the bone and tissues separating the two passages in the nose. 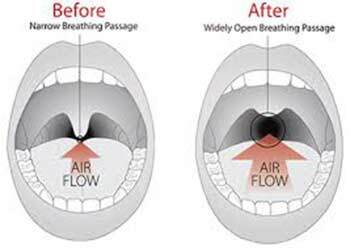 This is often carried out where a deformity or damage interferes with normal breathing. This removes soft, round tissues (polyps) that can project into the nasal passages blocking a free flow of air. Implanting plastic cylinders into the soft palate with the intention of stiffening it and thereby reducing the vibrations. This procedure involves the injection of chemicals in to the soft palate with the intention of making it less prone to vibration, similar to implants. The effectiveness has been found to reduce over a relatively short period of time. Sometimes a change of lifestyle can be the most effective way of stopping snoring but, unfortunately, this is not always the case. There are available a number of mechanical devices that, although they will not cure snoring, will stop snoring or at least greatly reduce it. According to the Department of Otolaryngology at Columbia University Mandibular Adjustment Devices (MAD) are actually more effective than surgery for enabling a better night's sleep. Continuous positive air pressure (CPAP) masks that are worn at night are highly effective but are not as well tolerated as MADs by users. All professionals agree that snoring surgery should be the last resort. Snoring surgery, as has been shown, is not particularly effective in many cases. It can be painful and for some treatments this pain has to be endured several times to achieve a result. The effects do not seem to be long lasting. Although research continues to find an effective '˜cure' for snoring, at the moment it would be hard to suggest surgery except in the most severe cases that have failed to respond to other less invasive treatments. My mom is quite the snorer and I was interested in seeing what options there were for treating it. 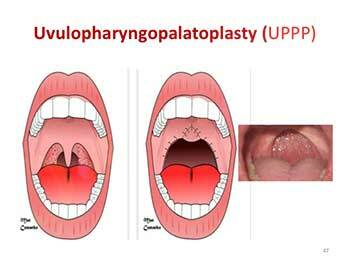 It’s interesting that in UPPP, they sometimes remove parts of the uvula to help reduce snoring. Although it is recommended to get something like this done as a last resort, I will have to mention it to my mom. Thanks for the neat info!